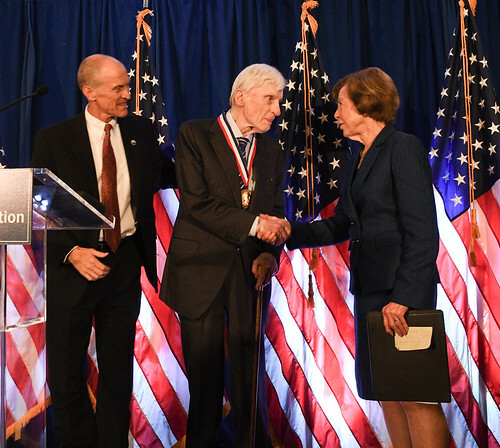 The Gerald R. Ford Presidential Foundation presented Senator John Warner with the 2018 Gerald R. Ford Medal for Distinguished Public Service at its Annual Foundation Dinner in Washington, D.C. In presenting the Public Service Medal to Warner, Carla A. Hills was joined by Foundation Chairman Mike Ford and Trustee Steve Ford. Hills recognized Senator Warner’s lifelong commitment to public service throughout his career which included service in the U.S. Navy during World War II, the U.S. Marine Corps during the Korea War, Undersecretary of the U.S. Navy, 61st U.S. Secretary of the Navy, and U.S. Senator from Virginia. Senator Warner was sworn in by Vice President Gerald R. Ford to be the Director of the American Bicentennial Administration on April 11, 1974 and joined President Ford on the flight deck of the USS Forrestal to initiate the ringing of the Bicentennial Bells across the nation on July 4, 1976. While still in office, Senator Warner, in his capacity as Chairman of the Senate Armed Forces Committee of the United States, introduced an Amendment to Senate Bill 2776 that was presented to the United States Senate on June 13, 2006. The Amendment was to name our nation’s newest nuclear-powered aircraft carrier, the USS Gerald R. Ford (CVN-78). John W. Warner has devoted his life in service to the American people as the second-longest serving U.S. Senator in Virginia’s history. Born in Washington, D.C. to John W. and Martha Budd Warner: he grew up in Washington and graduated from Woodrow Wilson High School. He enlisted in the United States Navy during World War II, shortly before his 18th birthday. He left the military as a petty officer third class and went to college at Washington and Lee University, followed by the University of Virginia Law School. During the Korean War, he joined the U.S. Marine Corps. Senator Warner served for five years as Under Secretary, and later as Secretary, of the U.S. Navy. He was appointed by President Gerald R. Ford to be the Director of the American Revolution Bicentennial Administration. Soon after the Bicentennial activities concluded, he began considering a political office for himself. In 1978, he entered politics, winning the Virginia election for U.S. Senate. His committee memberships included the Environment and Public Works Committee, the Senate Committee on Health, Education, Labor and Pensions, and the Senate Select Committee on Intelligence. While still in office, Senator Warner, in his capacity of Chairman of the Senate Armed Forces Committee of the United States, introduced an Amendment to the Senate Bill 2776 that was presented to the United States Senate on June 13, 2006, to name our nation’s newest nuclear-powered aircraft carrier, the U.S.S. Gerald R. Ford (CVN-78). Throughout his extraordinary public service career, Senator John Warner has demonstrated the personal and professional qualities exemplified by his dear friend President Gerald R. Ford – Integrity, Strength of Character, Diligence, Patriotism, and Sound Judgment. He is indeed a worthy recipient of the President Gerald R. Ford Medal for Distinguished Public Service. The Gerald R. Ford Presidential Foundation fosters increased awareness of the life, career, values and legacy of America’s 38th President. It does so through activities designed to promote the high ideals of integrity, honesty, and candor that defined President Ford’s extraordinary career of public service. The Foundation promotes the ideals, values, commitment to public service and historical legacy of President Gerald R. Ford and further promotes greater civic engagement and recognition of integrity wherever it exits in the public arena. It supports permanent and changing exhibits designed to promote historical literacy; conferences; educational outreach and other programs, both scholarly and popular, including at the Gerald R. Ford Presidential Library and Museum.